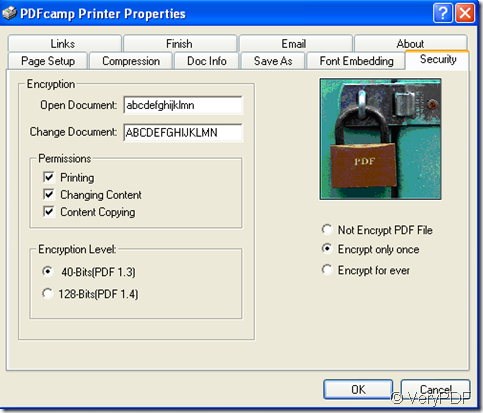 ← Is your PDF Printer support hyperlinks detection? How to set file permissions to restrict printing, copying, and future modifications to PDF document? File permissions are the system's way of telling you what you can and cannot do with a file or folder. PDF file permissions include printing,changing content and content copying. Each of these permissions can be set in the software PDFcamp Printer to protect the safety and privacy of pdf files. Now PDFcamp Printer will show you an easily understood way to set file permissions. Step1.You should open a document which you want to print to pdf file and click “file”—“print”. Step2.You ought to set parameter which is named “Security” in properties. You can set encryption of “open document” or “change document” which has two levels of 40-bits and 128-bits as your will.You can see there are three permissions on this interface. You can check anyone of them,of course all checked is allowed.You can also select not encrypt the file,encrypt once or for ever. If everything is done,you can click “ok”. Step3.Save and name the file and print. So the new resulting pdf file is restricted by the permissions you have just set by PDFcamp Printer, and the file will be more safer. How do I download email/folder to PDF format?